If you are tired of stealing your wife’s electric face cleansing brush and are looking for a sonic cleansing system designed for a man, there are a few products on the market to be aware of. Men can, of course, use any of the favorite cleansing brushes that women use (i.e., the Clarisonic Mia or the Proactiv Deep Cleansing Brush), but they can also really benefit from some of the unique features of the systems that are created for men’s thicker, often oilier skin. Face cleansing systems can help to get rid of sweat, dirt, and oil, much better than hand washing alone. Some of the benefits of using a face brush include evening out your skin tone, helping prevent breakouts and blemishes, making medications and moisturizers absorb better, and best of all for men, giving you a closer shave and fewer ingrown hairs. 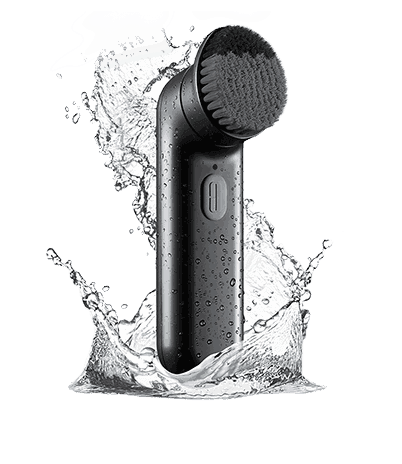 The LUNA™ for MEN’s is an excellent option if you have tried a Clarisonic device and found it to be too harsh or abrasive. The Luna is so gentle that you can use it every day without irritating your face. 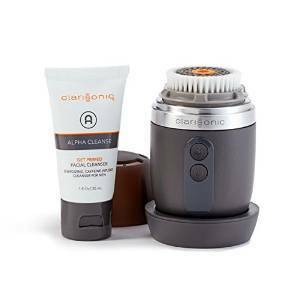 It has silicone touch-points that remove dead cells, and unclogs pores; it also helps to prep the skin for a more comfortable shave that can prevent razor burn. The Luna has a couple of cool features like signaling you when it is time to change to a different zone of your face. It also has a particular anti-aging routine that you use after you have washed off your cleanser. 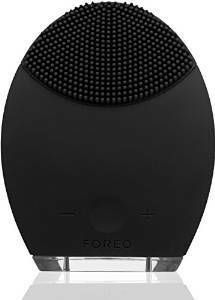 The company has an excellent warranty for this item; once you have registered the product on FOREO website, your warranty will extend to 2 years. Users love the fact that they don’t have to replace any brushes and the battery charge lasts for months. Reviewers often note that because of the silicon it has a clean feel to it, the silicone also makes it handy to take to the gym because you can dry it off quickly. It is also reported to work well for users who have very oily complexions, as well as helping users with sensitive skin to minimize shaving bumps and ingrown hairs. This Clinique Sonic System was developed by dermatologists specifically for men’s skin. It has a purifying brush head that has charcoal grey bristles that helps to clean more effectively than just hand-washing. On the head itself there are two bristle types: a softer area that you use for your cheeks, and a more firm bristle area that you can use on your forehead, chin, or nose. This two-tone brush vibrates rather than rotates. A built-in timer stops movement after 30 seconds. It charges via a stand with a USB cable, and a full charge lasts 180 minutes. What users love: Users love that the Clinique system is so gentle that they can exfoliate and clean with the brush every day. Reviewers also mention that the battery life is excellent, lasting about 3 hours on one charge (if you use it 60 seconds a day, you can go for weeks without having to charge it.) People also love that you get the two different types of bristles on the head, allowing you to use the stiffer bristles on the t zone and the softer bristles on the cheeks. The combined bristle type make it less time consuming than having to change heads for different areas of the face and neck where you want a different kind of clean. A lot of reviewers also mention that their shaving regimen has dramatically been enhanced, allowing for a more comfortable and closer shaving experience. Users who are looking for a deep clean love the Alpha Fit. The bristles are soft, and the device is easy to use in the shower or over a sink. It holds a charge for quite a few uses. The size makes it suitable for travel, and the charger is very portable. Reviewers also report that it is excellent for beards and helps to soften them and make them more comfortable. Some users have said that the Alpha Fit helps to clean beards deeply, that helps with avoiding breakouts due to ingrown hairs. Some individuals feel the cleanser that comes with the device has an overpowering fragrance, but you can use any product that you want with the device. Using an electric brush allows the user to get six times better cleaning than with hands alone. For men, these devices have the added benefit of prepping skin for shaving, creating a closer shave and less razor burn or ingrown hair problems. Individuals with beards, also find that the brushes can help to clear areas of the beard that may be prone to breakouts and leave the beard softer and more comfortable. Sonic face systems have become wildly popular products in recent years; people love them and find that their complexion is very much improved after using them. Since these devices aren’t cheap, there are a few things to be aware of before buying one. A lot of people have breakouts after starting to use a face brush. Breakouts are a fairly common occurrence and should clear up in a few weeks as dead cells are removed. Skin brushes generally improve acne over time with proper use. Although if you do have acne, avoid using the device over any infectious open wounds, but you can use the brush around areas with acne. You should also make sure you clean the head with soap and water or alcohol to avoid acne-causing bacteria build-up. If you buy online, you need to make sure you are buying from an authorized dealer. There are some reports of fake products being sold online. If you aren’t sure if any product you have purchased is the real deal, register it as soon as you received it on the manufactures website. If you are not able to register it, return it to the seller right away as it is probably a diluted, expired, or counterfeit product that may not be safe to use or perform as tested. Don’t use any of these devices more than is recommended. Ensure you follow all of the manufacturer’s instructions. Overuse can lead to broken capillaries, excessive dryness, irritation, redness, and sensitivity. Do not use if you have: sensitive, sunburned, broken or thin skin as well as rosacea, psoriasis, eczema, or skin that is prone to broken capillaries or redness. Don’t share brushes with family members; if they are not cleaned properly and replaced after three months, they may hold acne-causing bacteria in the bristles. Don’t use these products with other exfoliates. To find the best facial system for you, you will want to have a close look at the different types of features that are offered on the various models. Since facial cleaning devices are electric, they need power to run the motor. Most systems generally use either a rechargeable battery or AA batteries. The higher-end models all use rechargeable batteries that typically have relatively long battery life. Most users charge the battery well before it dies, so you don’t have to worry about running out of power in the middle of washing your face. A couple of products use a charging dock base that connects via USB and can be charged using a computer. One of the most important features to be aware of is the number of speed setting a particular device has. Most users are fine with just one setting, but you can get a device with up to three different speed settings. Generally, you will pay more for more settings. Depending on how you are going to be using the device, you may find that one-speed is all you need, or you may want a more vigorous cleaning and opt for the faster-rotating speed. The Clinique and the Mia 1 offer one-speed setting, while the Luna and the Clarisonic Alpha Fit offer two settings. If you would like three settings, you could try the Clarisonic Aria. The benefit of getting just one setting means the device is straightforward to use. Two settings are great for users who are looking for a deeper cleansing or cleaning a beard. People that use the three speeds want to be able to give certain areas of their face a more vigorous exfoliation. The systems we included in our top picks all have guarantees from 1 to 2 years. Some brushes you can buy do not come with warranties. Before purchasing, check that any product you are considering has a warranty and the period for the warranty. You should also ensure that you retain proof of purchase. You may need to register the product on the manufacturer’s website. A lot of men like to wash their face in the shower, and most of the higher end products designed for men are waterproof and can be used in the shower. Having a waterproof device is usually a good idea for any product you purchase that will be used around a sink or near a shower. Some systems come with multiple heads that are for different purposes (With some Clarisonic devices you can get heads for normal, deep pore, sensitive and delicate). The Clinique Sonic System’s has just one brush head, but there are two types of bristles on the head itself for different areas of the face. Electric face cleaning systems range in price from $20 to $200. If you are looking for a simple budget model the Olay Professional ProX Advanced Cleansing System is a great option, it has two speeds, one soft brush head and is very easy to use. It is available in most places that you would buy Olay products. If you would like a product that has a warranty, has different speeds for different parts of your face and has the option to use different types of heads, you will need to speed more for these types of features. Most dermatologists recommend using an electric facial brush no more than two times per week, although the Luna and the Clinique system are gentle enough that some customers use them one a day. To use, you apply your favorite foaming cleanser to your face beforehand or directly onto the brush head (refer to instructions for any device you purchase). Take the device and gently move it around your face for approximately 60 seconds. You should not use on the eye area since the skin is too delicate. If you are looking for something to brighten up your complexion and are finding that whatever creams and cleansers you are using aren’t entirely giving you the boost that you need, a sonic face system could be exactly what you need to help get your face looking great. Just remember if you do try out a system, it may take your skin a couple of weeks to get used to it, some users find that brushes cause them to have breakouts, but if you stick with it, you should see improvement after a couple of weeks. Another thing to keep in mind is that you need to replace the head (on some products) every three months as bacteria can live in heads and if they aren’t cleaned properly or replaced you could be making your skin worse without realizing it. It is also important not to overuse a face brush (not more than once a day, generally recommended doing it two times a week) as it can cause dryness and irritation. Many people have gotten great results using an electric skin brush and find them to be a worthwhile investment.